SALT LAKE CITY -- A Utah police officer seen on video roughly arresting a nurse who refused to draw blood from a patient was fired Tuesday from his part-time paramedic job. Salt Lake City Detective Jeff Payne's termination came after he said on the video that he'd bring transient patients to the hospital and take the "good patients" elsewhere to retaliate against nurse Alex Wubbels. Those remarks were concerning for Gold Cross Ambulance President Mike Moffitt, who said he'd heard them for the first time when the video was released last week. "That's not the way we conduct our business, that's not the way we treat people in our city," Moffitt said. Wubbels was following hospital policy when she refused on July 26 to let Payne take blood without a warrant or formal consent from the patient who was unconscious in the hospital burn unit. He had been in a car accident that started with a police chase. Payne maintained in his report that he wanted the blood sample to protect the man rather than prosecute him. 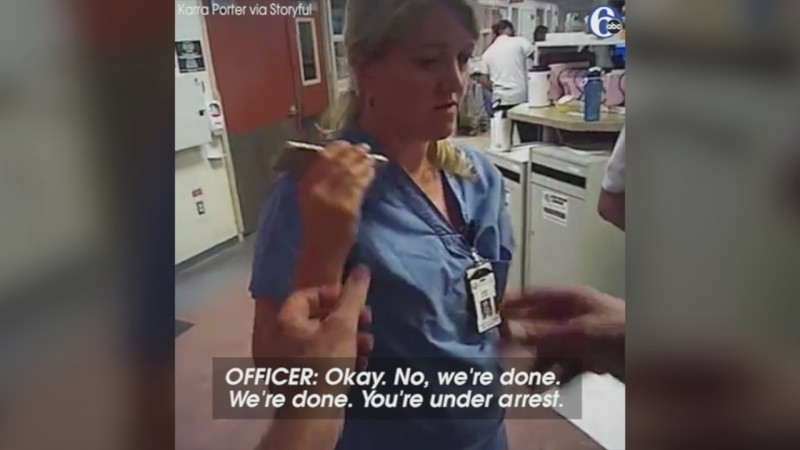 Police body-camera video shows Wubbels calmly explaining that she could not allow a blood draw from a patient who hadn't been arrested or consented unless police had a warrant. They did not, but Payne insisted and put her on the phone with his lieutenant who said she would be arrested if she didn't agree. The dispute ended with Payne handcuffing Wubbels and dragging her outside while she screamed and said, "I've done nothing wrong!" Her lawyer, Karra Porter, said she can understand ambulance company would be troubled by his comments and the decision to let him go wasn't surprising. Payne was put on paid leave by Salt Lake City police after the video emerged. A second officer was also put on leave after authorities opened a criminal investigation into the arrest. The other officer has not been identified. Police have said the lieutenant's actions are also under review. Payne joined Salt Lake City police more than 20 years ago and worked for Gold Cross as an EMT and paramedic since 1983. He was generally a hardworking, conscientious employee who followed the rules, so his behavior on the video was shocking, Moffitt said. Gold Cross is a private company that contracts with Salt Lake City to respond to medical calls in the city.